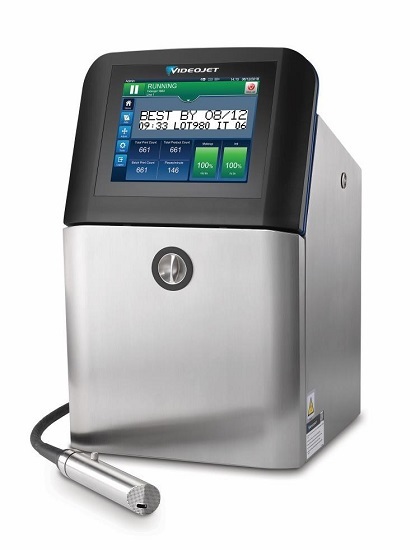 Using industry leading predictive capabilities including an industry-first ink build-up sensor, the brand new Videojet 1860 continuous inkjet printer (CIJ) provides up to 8 hours advance notice of the most common potential fault conditions that can impact on line uptime. For over 40 years, Videojet has been a global leader in CIJ printing, enabling manufacturers to deliver their goals on increased productivity. Videojet 1860 is designed to enhance productivity today and evolve as your future production needs continue to change. With the 1860, Videojet has re-imagined continuous inkjet printing technology. The Videojet 1860 integrates leading on-board intelligence and communication abilities with revolutionary technology elements to help meet the ever evolving and expanding needs of manufacturers. The 1860 delivers unparalleled uptime performance that can increase productivity and lower costs. Its uptime capability enables performance without surprises. An industry-leading suite of predictive capabilities allows for corrective actions prior to many of the most common downtime causing events. The 1860 utilizes over 50 real time sensors to continuously monitor 150+ key indicators of printer performance; providing expert diagnostics, analytics, and guidance. The revolutionary nozzle system features a predictive gutter build-up sensor, and provides advance notice of the most common potential fault conditions. Alert notifications are displayed on the printer and can be sent to a smart device, allowing for pre-emptive corrective action during line change over, or other planned production stoppage. In addition, the 1860’s fluid system features a make-up reserve tank, which can keep the printer in action for up to a full shift, even if a supplies refill alert goes unactioned. The 45 degree slanted printhead design delivers increased versatility through better line integration, with more mounting options providing closer proximity to the product on the line. The printhead can get as close as 2mm to the product, even in gable top or other angled packaging applications, enabling crisper, higher quality codes. In addition, the 1860 can adapt to a manufacturer’s connectivity needs through simple integration with existing factory systems using industry standard protocols such as Ethernet/IP™, Profinet® and high speed network connection. The 1860 has been engineered to fit on virtually any production line through its durability, versatility and adaptability. The intelligent airflow system of the 1860 directs clean, cool air to critical components in the printer, extending the stable operating temperature range to 0-500C, even in the most challenging environments. In addition, the 1860 is available with an IP66 rating, eliminating the need to remove the printer from the line during wash-down. Building on two years of experience offering remote service, Videojet is excited to launch VideojetConnectTM Remote Service providing operators access to the world’s largest service network of technical experts at the touch of a finger, connecting the Videojet technician directly to the line for immediate advice and remote problem solving, allowing for real-time corrective action, and minimizing reliance on in-house maintenance teams to deliver increased uptime. Videojet also applied a minimal touch philosophy to routine maintenance tasks, allowing them to be performed in line with production schedules. The new SmartCellTM service module simplifies routine maintenance with three color-coded, easy to replace components that can be changed in minutes, allowing operators to focus their capacity on production rather than maintenance. As manufacturing, production and coding needs continue to evolve, the 1860 has been engineered as an extendable platform to assist with both present and future printing needs and production processes. Videojet Technologies is a world-leader in the product identification market, providing in-line printing, coding, and marking products, application specific fluids, and product life cycle services. Our goal is to partner with our customers in the consumer packaged goods, pharmaceutical, and industrial goods industries to improve their productivity, to protect and grow their brands, and to stay ahead of industry trends and regulations. With our customer application experts and technology leadership in Continuous Inkjet (CIJ), Thermal Inkjet (TIJ), Laser Marking, Thermal Transfer Overprinting (TTO), case coding and labeling, and wide array printing, Videojet has more than 345,000 printers installed worldwide. Our customers rely on Videojet products to print on over ten billion products daily. Customer sales, application, service and training support is provided by direct operations with over 4,000 team members in 26 countries worldwide. In addition, Videojet’s distribution network includes more than 400 distributors and OEMs, serving 135 countries.